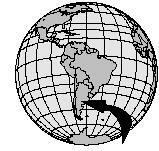 Argentina is a wedge-shaped country, the second largest (after Brazil) in South America. In the west, it has the Andes Mountains, but the majority of Argentina's land is low. Because Argentina lies in the Southern Hemisphere, the winter months are May through August, and the warmest summer month is January. Argentina's climate and rich, lowland regions combine to make it one of the world's greatest food-producing nations. More than 4 percent of the world's cattle are raised by Argentine cattle ranchers. Argentina is also South America's largest producer of honey, an ingredient that makes its way into many delicious Argentine desserts. Native Indians lived in Argentina many years before the European explorers arrived. Members of an Indian tribe in the northern part of Argentina were farmers who grew squash, melons, and sweet potatoes. 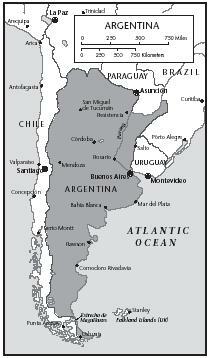 Spanish settlers came to Argentina in 1536. Between 1880 and 1890, nearly one million immigrants came from Europe to live in Argentina. Most were from Italy and Spain. The Italians introduced pizza, as well as all kinds of pasta dishes, including spaghetti and lasagna. British, German, Jewish, and other immigrants also settled in Argentina, all bringing their styles of cooking and favorite foods with them. The British brought tea, starting the tradition of teatime. All of these cultures influenced the dishes of Argentina. Beef is the national dish of Argentina. There are huge cattle ranches in Argentina, and the gaucho, or Argentine cowboy, is a well-known symbol of Argentine individualism. Many dishes contain meat, but prepared in different ways. A favorite main course is parrillada, a mixed grill of steak and other cuts of beef. Grilled steak is called churrasco , a beef roast cooked over an open fire is called asado , and beef that is dipped in eggs, crumbs, and then fried is called milanesa . Carbonada is a stew that contains meat, potatoes, sweet potatoes, and chunks of corn on the cob. Brown beef in separate batches so that all of it gets cooked. Remove from the pot and set aside. In that same pot, cook tomatoes, pepper, onion, and garlic until soft. Add bay leaves, oregano, and chicken stock, and bring to a boil. Return beef to the pot, and add potatoes and sweet potatoes. Cover and simmer 15 minutes. Stir in zucchini and corn. Simmer 10 more minutes, or until vegetables are almost soft, then add the peaches and pears. Because many Argentines are descendents of the Italian immigrants who came to Argentina in the late 1800s, Italian dishes are found throughout the country. Some favorite Italian dishes include pizza, all kinds of pastas (such as spaghetti and ravioli), and ñoquis , (gnocchi—potato dumplings) served with meat and tomato sauce. Argentines eat more fruit than almost any other group of people in the world. Some favorite fruits include peaches, apricots, plums, pears, cherries, grapes, and tuna , the fruit of a prickly pear cactus. Empanadas , little pies usually stuffed with beef, vegetables, and cheese, are a favorite dish. These are eaten by hand and they are often enjoyed as a snack, or may be carried to school for lunch. Chimichurri , a dipping sauce, is usually served with empanadas . Because the sauce has to sit for two hours before eating, it is prepared before the empanadas . Combine all ingredients in a bowl and let sit for at least 2 hours before serving with empanadas . Brown the ground beef and onions in a frying pan until meat has lost all its pink color. Drain the mixture well, and allow it to cool. In a bowl, mix the flour, butter, egg, yolk, and vinegar together by hand. Stir the salt into the water and sprinkle water, a little at a time, over the flour mixture. For each empanada , roll ¼ cup of dough into a 9-inch circle. Put ½ cup filling on the circle, and fold it in half. Press the edges of the dough together, and poke a small hole in the top using a toothpick. Place on a cookie sheet. Repeat process until all the dough and filling are used up. Serve hot with chimichurri . Empanadas, homemade or purchased from a vendor, are popular for lunches or as snacks. Lent is the 40-day period preceding Easter in the Christian year. During the week before Lent, a large festival, Carnival, is celebrated in many parts of Argentina. During Carnival, people dress up in costumes and dance. They eat spicy food, including corn stew and humitas en chala (corn patties wrapped and cooked in their husks). It is a tradition to eat a cake in the shape of a large ring. On Easter, children eat chocolate eggs with tiny candies hidden inside. Because it is also tradition in the Roman Catholic Church to not eat meat during Lent, Argentines eat more seafood dishes during this time. Bocaditos (finger sandwiches), made with shrimp are a popular lunch or snack food during Lent. Cut crusts off the bread. Spread a thin layer of cream cheese on each slice of bread. Cut into triangles or rectangles. On Christmas Eve, celebrated on December 24, Argentines eat a late meal of cold beef, chicken, or turkey, and fruit salad. Because Christmas occurs during summertime in South America, Argentines often eat the meal outside on decorated tables. After dinner, they eat almonds, dried fruits, and pan dulce , a sweet bread that is similar to fruitcake but has fewer fruits and nuts. In a large bowl, whisk together the honey and lemon juice. Stir in the fruit, and serve topped with a scoop of frozen yogurt. Fruit salad offers a refreshing balance of sweet and tart flavors with honey and lemon juice in the dressing, and a topping of sweet, light frozen yogurt. In many areas of Argentina, people hold festivals to honor aspects of the environment. For example, a city on the Atlantic coast celebrates the seafood harvest that is brought in from its fishing grounds. It is tradition for people to eat a seafood feast of shrimp, crab, and scallops. After the feast, a parade with people dressed in sea-creature costumes is held. Someone dressed as The Queen of the Sea leads the parade, sitting in a giant seashell. 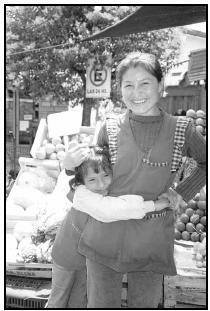 An Argentine fruit and vegetable vendor and her daughter greet customers at a market. comida (coh-MEE-dah, lunch) such as a pizza from a cafeteria. A farmer eats a hot dish for lunch, carried out to him in the field, of beef, potatoes, and chunks of corn-on-the-cob. Upper-class city families usually eat a large midday meal of meat, potatoes, and green vegetables. In the late afternoon, Argentines have a snack of tea, sandwiches, and cake to hold over their appetite until dinner ( cena, SAY-nah), typically eaten around 9 P.M. The tea-time tradition comes from the British immigrants that brought tea to Argentina in the late 1800s. Vendors sell food on the streets (the equivalent to "fast food"). Ice cream vendors sell helado, Argentine ice cream, and warm peanuts, sweet popcorn, and candied apples. Some vendors sell choripan (a sausage sandwich) and soda. Empanadas , little pies stuffed with beef, chicken, seafood, or vegetables, are a popular snack. 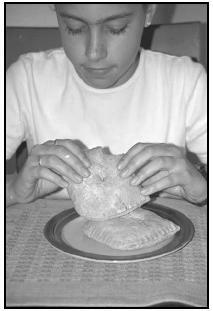 Children can take vegetable-filled empanadas to school for lunch. A favorite drink is a submarino , or milk with chocolate syrup. Place the spoon with the syrup in the cold milk, but don't stir it. Drink a little milk, then lick some of the chocolate off the spoon. Continue until glass is empty. The dinner meal has several courses, including meat dishes, and ends with dessert. Dulce de leche (milk jam) is a favorite dessert for many Argentine children. It is often eaten with bananas or as a filling in alfajores (corn starch cookies). To make Dulce de Leche (milk jam), fill a pan with sweetened, condensed milk and cover the pan with foil. Place it in a larger pan with about one inch of water in it. Most people in Argentina receive adequate nutrition in their diets, although the World Bank classifies a small percentage as malnourished. Almost three-fourths of the population has access to safe drinking water and sanitation (hygienic conditions and safe disposal of waste products). A small percent of children under age five are underweight (about 2 percent) or stunted (are short for their age, 5 percent). These children are from the poorest Argentine families, and may live in cities or rural areas. Argentina . Boston: APA Publications, 1997. Greenberg, Arnold. Buenos Aires: And the Best of Argentina Alive! Edison, NJ: Hunter Publishing, Inc., 2000. Hintz, Martin. Argentina . New York: Children's Press, 1998. Parnell, Helga. Cooking the South American Way . Minneapolis: Lerner, 1991. Peterson, Marge. Argentina: A Wild West Heritage . Parsippany, NJ: Dillon Press, 1997. Global Gourmet. [Online] Available http://www.globalgourmet.com/destinations/argentina/ (accessed March 1, 2001). Latin American Recipes. 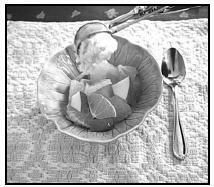 [Online] Available http://www.ma.iup.edu/Pueblo/latino_cultures/recipes.html (accessed March 6, 2001). Margarita's Favorite Recipes. [Online] Available http://www.lacabe.com/marga/food/recipes/alfajores.html (accessed February 24, 2001). First of all, Argentines do not eat spicy foods like Mexicans do. The food may get spicier as you work your way into the interior of Argentina, but in the city, it isn't. Our empanadas do not look like that at all, at least not the original Argentine empanada. A "submarino" is NOT made with chocolate syrup. It is a bar of chocolate submerged in hot milk. Hence, "submarino" meaning submarine. The chocolate bar being the submarine. It melts in the warm milk. Also, Dulce de Leche, is not simply a boiling condensed milk. It is a process of boiling milk or creme with sugar and constantly stirring. It comes close, but a connoisseur will tell you that is a no no. Also, since when are empanadas eaten with chimichurri? Chimichurri is for asados. Many other fopas are mentioned, but I won't go on. I might not be Argentine,but I'm totally in love with Argentine food!And this site truly rocks! No way spicy food is eaten in Tucuman! There may be a "spicy sauce" but I can tell you from personal experience (my family is from Tucuman) it compares to the MILD salsas you can get in the states. That empanada is the weirdest looking thing I've ever seen. Lots of misinformation on this site, sadly enough. Lots.